Building work in progress near the Assyrian Court of the reconstructed Crystal Palace exhibition hall in Sydenham Hill. 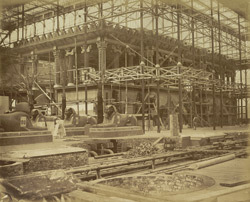 The building, originally designed by Joseph Paxton for the Great Exhibition of 1851 in Hyde Park, housed a showcase of the century's technological achievements. The prefabricated building was dismantled after six months and rebuilt in south-east London. It was a milestone in the development of modern architecture for it's innovative use of wrought iron and glass, symbolic of English power both from a political and engineering standpoint.